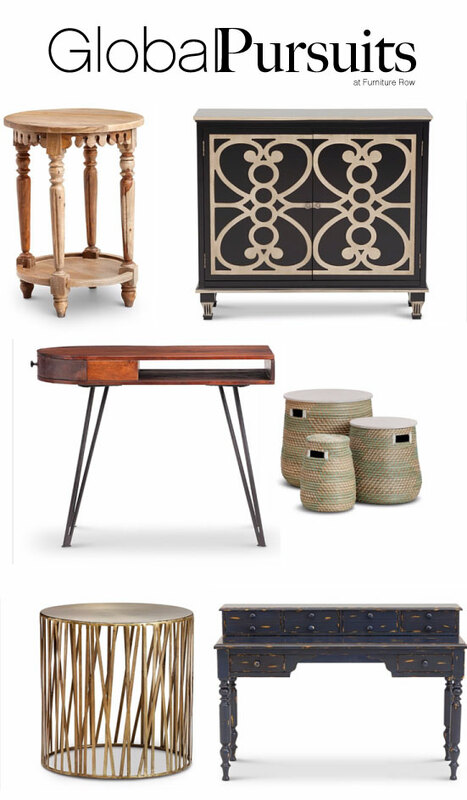 Make a global-inspired statement with unique artisan products from around the world with the Lost and Found collection from Furniture Row. Raja End Table // Scallops, finials and style – The Raja End Table brings intricately carved style to your space. With scalloped detailing, elegantly sculpted finials, and ample storage, this table is as beautiful as it is functional. This one-of-a-kind table is wonderful next to a favorite reading chair, or anywhere at all. Bring home the Raja today, and enjoy for years to come. Laslo Hall Console // Storage with intricate details – Add storage and striking style to your hallway with the Laslo Hall Console. Complete with storage, this piece features a beautiful, dramatic two-toned patter on its doors. Made solidly of wood, this console is sure to be a timeless favorite in your home. Hairpin Desk // Striking style that works – One-of-a-kind style comes to your home office with the stylized yet functional Hairpin Desk. With mid-century lines and a striking silhouette, this piece is sure to catch everyone’s eye. Beautifully finished, durably crafted to last, the Hairpin Desk is a work of art you will love to work with. Seagrass Set of 3 Storage Tables // Basket storage with table tops – The Seagrass Storage Tables bring a touch of seaside style to your space. With a casual woven base, these tables feature basket storage and removable wooden tops. Great for storing blankets, books, and more, the Seagrass Storage Tables combine style and functionality for a one-of-a-kind look. Enjoy the natural, earthy green tones of these tables, and place them anywhere in your home. Murray End Table //Designed from reclaimed metal for our Lost and Found Collection with an Antiqued Brass finish. Oldsmar Desk // Aged to perfection – The Oldsmar Desk is a truly one-of-a-kind piece. Featuring a stylishly distressed finish, this rich blue writing desk boasts a casual, lived-in look you will love. Durable, designed to last, and made from reclaimed wood, the Oldsmar is a scaled-down desk addition to any workspace.